Comics In 5 Panels: Johns Month(and a half): Thy Kingdom Come. Before we talk about this story, I better explain what "Kingdom Come" is. "Kingdom Come" is a story about an alternative DCU, where Superman gave up the good fight, realizing that the people he swore to protect preferred brutal 90s heroes, who weren't afraid to kill. After Wonder Woman tells him to grow a pair, Superman get's out of his Fortress Of Solitude for the first time in 10 years, and realizes that the superheroes has gone out of control. He then reunites the Justice League in order to set things straight... AAAAAND then kinda screws it more up, by being TOO hard on the out-of-control heroes. 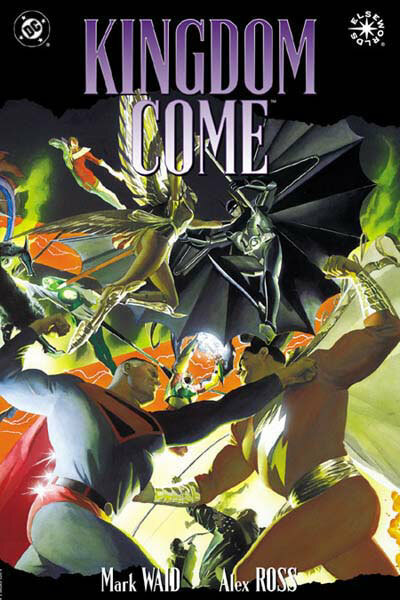 "Kingdom Come" is a glorious tale, and still my favorite comic-book of all time. If you haven't read it yet, you ought to. I would also like to recommend "The Kingdom", the sequel that sadly has a pretty bad reputation. 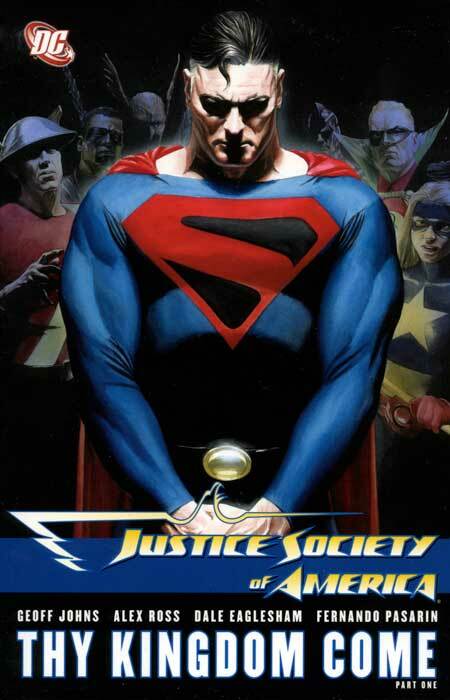 "JSA; Thy Kingdom Come" is a spin-off of a sort. The story takes place in the mainstream DCU, where Superman from the Kingdom Come universe by accident ends up there. And he is amazed to see a world that have not been ruined like his, and he praise all the heroes for not making the mistakes he and the other heroes in his world made He is pretty much the exact opposite of Superboy Prime! But he is also afraid, that what had happened in his world could happen is this one, and he ask the JSA for aid in order to find out if this world also has a Magog, the man who started the chaos in his world, and make sure that he wont do to this world what he did to Superman's. Even though it's an awesome 14 issue(and three special issues) story it has a HUGE problem; it came too soon. The series had just started, and had a lot of new characters(like Wildcat's son Tom, the new Amazing-Man and Lightning) and we didn't have a chance to get to know them properly before this huge story-arc started. It doesn't hurt the story, but it's not good for the team-book that we know so little about them, that they end up being fill-up characters. "Thy Kingdome Come" shouldn't have started at issue 9 of JSA, and we should have been given more time to let the new team-members grow on us. Also, this story(and the series) is much easier for you to read, if you have read the prior JSA series, since their is a lot of references to past events. But it's still a pretty damn good story. 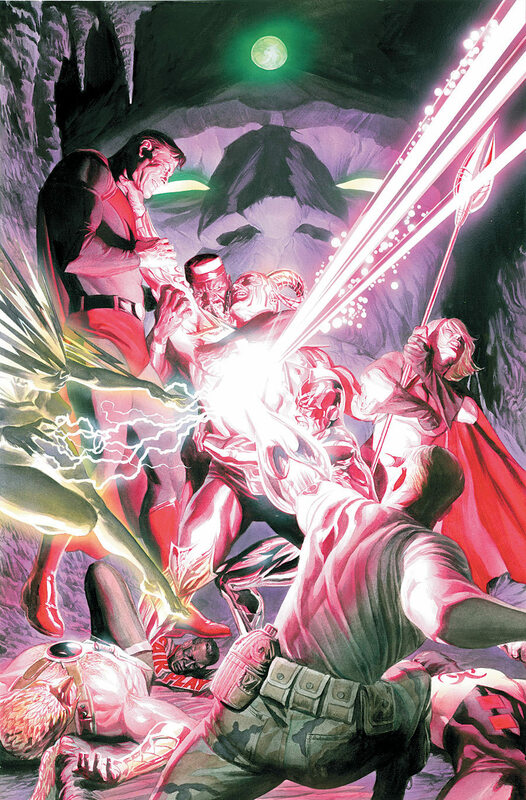 Johns wrote the story with Alex Ross(artist supreme, as well as one of the two writers of "Kingdom Come") so the "Kingdom Come" magic is there. If "Kingdom Come" is about the abuse of authority, "Thy Kingdom Come" is about whatever you should accept authority. The JSA is divided, as they can't agree whatever they should accept the presence of a god-like being, and if he is to be trusted. The ending kinda feels like a cop-out, as there is only one solution, but it's still a good story about whatever one should leave his fate entirely in a god's hands. And it has plenty of awesomeness, such as KC Superman punching freaking lightning!!! That's all for now. Next time, we will take a look at the absolute WORST story Johns has ever written.